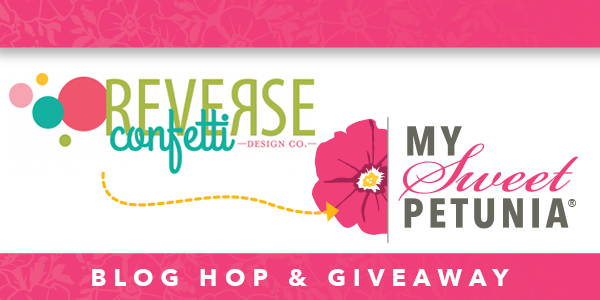 Dina Kowal Creative: My Sweet Petunia and Reverse Confetti! My Sweet Petunia and Reverse Confetti! I'm hanging out with the My Sweet Petunia team today - hope you'll join us for a special hop with Reverse Confetti! Prizes are involved... so keep reading for all the details! If you just happened on the blog hop because you're a regular reader of my blog, and you'd like to view the entire hop, keep reading and you'll find a full list of participants at the end of my post. If you're already hopping and you arrived here from Amy Rohl's blog you're doing just fine. I am slightly obsessed with the idea of rotating panels in the MISTI to create symmetrical designs - I used the strawberry and seeds from the Berry Sweet set this way, positioning the berry just once, and turning the panel for each impression with a flat side along the bottom. I embossed the stamped images with clear powder and loosely watercolored and splattered the panel for texture. I used the same technique with my second card - these small stamp are also part of the Berry Sweet set. I positioned them a few at a time, inking and rotating with each impression. It took several rounds to fill in the whole panel as you see it. I did a tiny bit of light shading on the leaves with a colored pencil. I love this cheery design, and I'm looking at all my small stamps in a new way! For my last card, I used a set called Something Wonderful... I stamped the roses in kraft ink on a kraft cardstock panel, then used colored pencils to layer color over the solid areas. The sentiment is double stamped with a kraft shadow and black embossing. I added a little texture to the background with stenciled ink and PanPastels. Both companies are sharing prizes for this hop - two lucky commenters from the hop will win one of two prizes: a $60 shopping spree at www.mysweetpetunia.com and a $60 shopping spree at www.Reverseconfetti.com! Be sure to comment by the end of the day on Sunday, March 25th - winners will be announced Monday on the Reverse Confetti and My Sweet Petunia blogs. Thanks for visiting me today! You're off to Heather Hoffman's blog next! 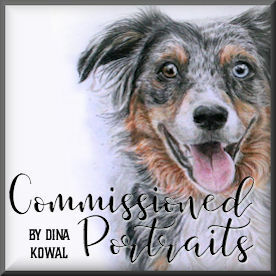 Dina Kowal <<<<<<<<<<<<<<<<< you're here! Wow! What fun projects. That tag is just gorgeous with those vintage colors. And I love your strawberry flower! Love all your cards. Thank you for the "rotating" lesson! Your coloring on the flowers is so beautiful! You inspire me to get out my pencils and practice! Oh my! I do love shaped cards. All of your cards are STUNNING. Your creativity with the berries is fantastic. I simply cannot choose a favorite. I have never seen a Misti other than photos. I had no idea it could be rotated. I am going to have to put it on my wish list. Goodness, Dina, your cards just make me smile! They are all so creative and fun and so very lovely. I love the strawberries made into a flower; genius! I love shaped cards. And those roses are swoon worthy. As always...Best of Show. Idolize you work. I love this idea and can't wait to try it with my Misti! Your cards are "something wonderful". Love that sentiment. Great cards! I especially love the last card! You are so talented. That last card is absolutely beautiful. I would never have thought to stamp in kraft on kraft! I must try that later today. Love the itty bitty flowers on the second card. I would love to see a video on these two cards. Never heard of anyone rotating their cards in a misti. With my eyes I don’t think I could get it positioned properly. But you did!! So berry sweet love the last card. I have never tried this with my misti but sure want to now!!! Beautiful cards, great idea. Would love a video! Such unique and beautiful projects! Love all you do and that tag is amazing! What cool ideas! I love that you used the misti to rotate without repositioning! So pretty. Love all the details, colors, patterns, and designs. Very creative shapes. Thanks for the ideas. Adore your projects! I, too, am in love with the idea of rotating panels in the Misti...especially to create wreaths! Love your creative cards. Beautiful coloring. Dina, these are wonderful! Love the ALL! Wow! All three of these are amazing! I've never tried rotating my cardstock in my Misti before, but I'm definitely going to try this technique out. This is such a fun and creative idea! Thanks for sharing! I love the layering you did on the kraft card. Just beautiful. Love the idea of rotating cards in the Misti! Can't wait to try. Each creation, so unique. I really love the strawberries. Great technique. Thanks for sharing! I've just started rotating pieces in the MISTI. So many possibilities! Loving this idea..... Strawberries toooooo, Love it... I am going to make some cards like this... Thanks so much..
Beautiful projects! Loved how the strawberry formed a flower instead. Terrific! Strawberry card is so clever. All the cards are great. I love that rotating card idea - gotta give that a try! The rotating card concept is showing up everywhere, may have to try that soon. Love the cards! Beautiful projects. I really like the strawberry flower card. 3 beautiful projects and loved your lesson on rotating!! 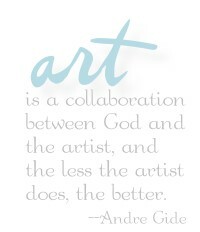 Great blog hop and so enjoying your work! Dina, I love the hexagon-shaped cards! What a great idea using the MISTI! And all the Reverse Confetti stamps have wonderful small images that will work beautifully. wow!!! your cards are absolutely amazing... especially that last one!! stunning! Oh my !! Your strawberry card is sooo lovely !! Beautiful cards. Love the Berry card and the design and the last card is so pretty with the unique shape as well as the beautiful purple flowers. Your creations are so sweet....love the strawberries the best. I'm going to need to get that set! Awesome cards and tag! Love that strawberry flower... great way to use the MISTI! Pushing up my jaw, I'm drooling over all three cards...very interesting techniques. I like your signature line at the bottom of this page...I'll use that as thought for the day! Beautiful work Dina - you always inspire! These stamps are gorgeous! Thank you too for the MISTI tip - I'll be using it! Love your Thanks so Berry Much! Very clever! Amazing and sooooooo beautiful. Love all 3 & your creativity shines!!! Fantastic cards! I love the shaped cards - I've never tried them and they look so gorgeous! Such a creative way to use the strawberry and seeds stamp. I love how you used the tiny flower stamps to make the second card!! And the card with roses on kraft is gorgeous!!! All three cards are so unique! I'm blown away with your cards and how you used the rotating technique to create the lovely designs. Thanks for the inspiration. What a great technique you've used with your Misti and stamps! The geometric patterns are super eye catching and unique. And your coloring on the kraft background looks amazing! Wow! Beautiful creations ... love how you used those berries and the floral is sooo sweet! That gorgeous last one... double wow! I loved the first card the way you loosely watercolored the background and berries rotating them to make the flower -- beautiful! Love all three cards especially the third one with the purple flowers. Love the berries as a flower,and the purple flowers are gorgeous too! I love the hexagonal card design! I rarely think of shaped cards, but I love it when they happen. And the overlapping effect of those strawberries is beautiful. And your last card is just amazing; I love all the depth you managed with the tone-on-tone stamping and the pencil coloring. Just gorgeous. Thank you so much for sharing with us! So pretty - love the strawberry flower and the tiny flowers. That strawberry wreath is just fantastic!